Game 2 of the post season match up between the Lady Rebels and the Lady Tigers found Dawson 1 down and looking to get a win to tie the series and live to play another game. After the loss to Fannin earlier in the day Dawson sent Maggie Schandera to the circle to avenge the previous game’s outcome at the hands of the Lady Rebels. Schandera stood tall and completed her task as she allowed only 2 runs on seven hits to very good Fannin line up. Going scoreless through 4 full innings the Lady Rebels broke the zeros on the board in the bottom of the fifth with 2 runs. That would be all for the Fannin offense against a dominate pitcher in Schandera. The Lady Cats hitters put up 4 runs on 8 hits in the game. The Dawson runs came in the fourth, fifth and seventh innings to finish the game with a score of 4-2. Getting it done at the plate were Carol Drak(1 for 4 with 1 run scored), Brandi Williams(2 for 3 with a run scored), Maggie Schandera(1-4 with 1 RBI) and Bella Henson(2 for 3, with a run scored. The Lady Tigers tallied 4 runs(3 earned) on 8 hits against Sneed of Fannin. 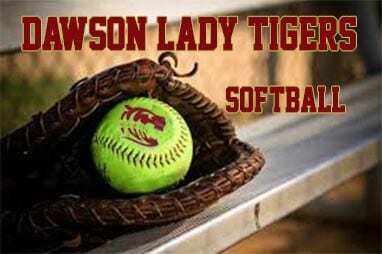 The 4-2 win for Dawson brought the series even at 1 game each and will be decided on Monday at Fannin Co. High School. Start time is 5:00 PM.